Once the season proper starts usually from early November in the northern hemisphere,or May in the southern hemisphere, the idea is to drive the fox from the covert and pursue the scent that it leaves for long distances over open countryside. The northern hemisphere season continues through to March or April. Drag hunting, an equestrian sport which involves dragging an object over the ground to lay a scent for the hounds to follow,can also be popular, either instead of, or in addition to, live quarry hunting. Drag hunts are often considered to be faster, with followers not having to wait while the hounds pick up a scent, and often covering an area far larger than a traditional hunt, which may even necessitate a change of horses half way through.A non equestrian variation, hound trailing, is practised in the Lake District. Since the UK hunting ban, hunts are using a mixture of an odoriferous substance with an oil in order to improve the persistence of the scent trail, and then to lay the scent about 20 minutes in advance of the hunt.Bloodhounds are also used to hunt a human runner in the sport of Hunting the Clean Boot. The Master of Foxhounds or Joint Master of Foxhounds operates the sporting activities of the hunt, maintains the kennels, works with and sometimes is the huntsman, and spends the money raised by the hunt club. Often the master or joint masters are the largest of financial contributors to the hunt. The master will have the final say over all matters in the field. Honorary secretaries are volunteers usually one or two who look after the administration of the hunt. The Treasurer collects the cap money from guest riders and manages the hunt finances. 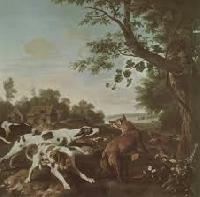 The huntsman, who may be a professional, is responsible for directing the hounds. The Huntsman usually carries a horn to communicate to the hounds, followers and whippers in.Some huntsmen also fill the role of kennelman and are therefore known as the kennel hunstman. In some hunts the master is also the huntsman. Whippers in are assistants to the huntsman. Their main job is to keep the pack all together, especially to prevent the hounds from straying or riotting, which term refers to the hunting of animals other than the hunted fox or trail line. To help them to control the pack, they carry hunting whips and in America they sometimes also carry .22 revolvers loaded with rat shot or blanks.The role of whipper in in hunts has inspired parliamentary systems including the Westminster System and the U.S. Congress to use whip for a member who enforces party discipline and ensure the attendance of other members at important votes. Carries out fox control. Most hunts where the object is to kill the fox will employ a terrier man, whose job it is to control the terriers which may be used underground to corner or flush the fox. Often voluntary terrier men will follow the hunt as well. 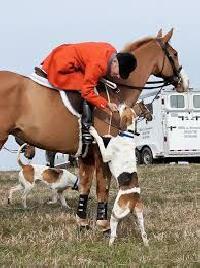 In the UK and Ireland, they often ride quadbikes with their terriers in boxes on their bikes.In addition to members of the hunt staff, a committee may run the Hunt Supporters Club to organise fundraising and social events and in America many hunts are incorporated and have parallel lines of leadership.Britain, Ireland and America each have a Masters of Foxhounds Association MFHA which consists of current and past masters of foxhounds. This is the governing body for all foxhound packs and deals with disputes about boundaries between hunts, as well as regulating the activity. The object of the fox is to get back to his burrow before being caught. The object of the hound is to catch the fox before he gets back to his burrow. Each player has a chance to be the fox and the hound, whoever gets further around the board as the fox wins the game.